A Roundup Of All The Aww-Dorable Moments At The DeepVeer Reception Tonight! After their grand Italian soiree, our favourite B-town hotties are finally husband and wife. Photos from their wedding at Lake Como gave hope to even the most cynical person! What happens when two of the best Bollywood celebrities get hitched? You can bet it's going to be a grand, star-studded, glittering affair. Knowing Deepika we were sure she was going to be dressed in her Sabyasachi best. Wild child Ranveer too had a grand party, classic Ranveer style. The photos were fierce and feline! Their second wedding reception which was hosted by the Bhavnani clan tonight was no exception. 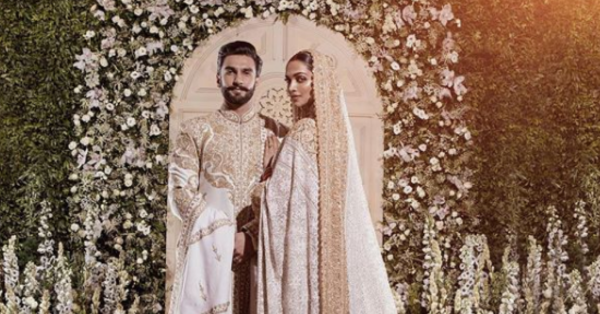 Deepika and Ranveer, dressed in white and gold, looked absolutely REGAL! Don't they look like real life royals? And don't even get me started on that glow. I can't take my eyes of a bronzed Deepika and a glowy Ranveer? Could it be makeup? I think it's loveeee! Just look at them, they're all smiles! And the way Ranveer looks at her...stay still my beating heartttt! It's not a Bollywood wedding without some naach gaana right? You gotta love Ranveer for being the most chill dulha, ever! Always humble and grateful, here's one of Baba posing with flowers that were gifted to them! While DeepVeer decided to dress in white and gold, Ranveer's fambam wore black. Rebels or colour-coordination at it's best? We'll leave you to decide! This is the second wedding function in India, the first was the reception Deepika hosted for her family and friends back home in Bangalore. The reception tonight was held for the media and took place at the Grand Hyatt in Mumbai. Rumour has it, there's going to be another reception on the 1st of December for the rest of the Bollywood fraternity. You know you can't keep your eyes off them! Stay tuned for more updates on DeepVeer.